I can remember my grandpa telling me that he used to sketched moon craters and similar objects with his homemade 4.25 inch reflector. He tried to have some of his sketches put into Sky and Telescope>, and unfortunately, they were never put in. I just got Sky and Telescope, and I don’t see any sketches in it. Perhaps I’m wrong though. I recently made an excelent detailed sketch of M42, on of the best nebulae you can view. M42 is good in most any telescope, but it was great the other day. Why? Because staying up late was worth it. Even with a Waning Moon some 40 to 50 degrees away, it was still really good. One of the only other times I’ve seen Orion- the constellation in general was at a PVAA star party at Mount Baldy. I mean, this was really good seeing. On a recent sketch from Astronomy Sketch of the Day, there is a nice sketch of M42-43, with a telescope with aperture of somewhere around 10 inches. The sketch is great, I tip my hat to them, but notice that the seeing when it was sketched was 3 out of 5. 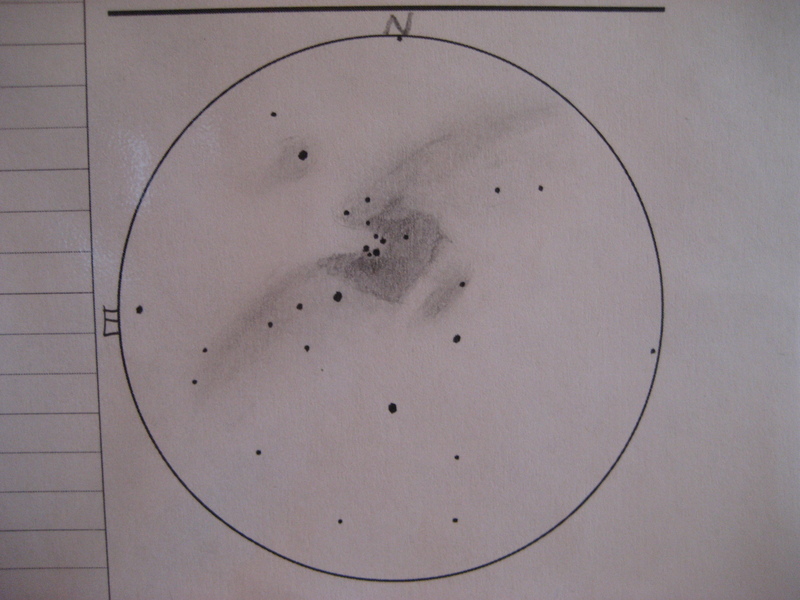 Most or all deep sky objects generally react well to darker/more transparent skies, so if you see my sketch below, notice that there is more structure and also notice more stars in the “Trapezium”. Notice that I can pick out the “E” and “F” stars in the Trapezium cluster; this was previously only attainable by the using the Orion XX14, or a 12″ Meade Lightbridge at Mount Baldy. I could not believe this much structure and defined detail in such a small telescope. There is an interesting article on Belt of Venus regarding sketching and how much can be seen in a small telescope. This article included seeing very detailed view of M101 with only a 50mm refractor. Read this really cool article. So the moral of the story is that even 6 inches can take you very deep in the sky, giving there’s decent viewing. One thing to remember is that the light pollution usually is less so after midnight as lights turn off and freeways and highways become vacant. I believe that most of the light pollution in La Verne is due to the 210 freeway that runs right through town. When it comes to observing the deep sky, the more you look the more you’ll see; an experienced observer with a 4 inch telescope will see much more detail/structure in all objects than an inexperienced observer with a bigger telescope.